New leaks have emerged regarding the upcoming Samsung Galaxy Note 5, hinting that the device will feature the new USB Type-C port. Although rumours of USB ports are unlikely to get the pulse racing, the technology behind USB 3.1 Type-C could make using our smartphones much quicker and easier. Type-C can transfer data at double the speed of USB 3.0 (around 10Gbps), so moving files, music and photos on and off your smartphone will be a lot faster. Type-C can also handle 20 volts and 5 amps of power, compared to the 5 volts and 1.8 amps that USB 3.0 supplies, which means we won't have to wait as long for our devices to charge. Perhaps even more usefully you can plug in a USB Type-C cable in any way – so no more fumbling in the dark trying to insert the charger. 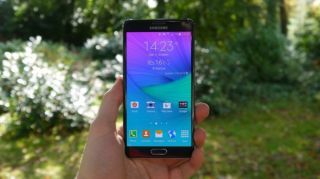 We've heard previous rumours that the Samsung Galaxy Note 5 would sport a 4K display, but according to a rumour reported by GforGames Samsung won't be slapping a ridiculously high resolution screen on its new device. The rumours didn't mention what resolution Samsung will be going for, but we've also heard 2K being mooted, so it could be that. The same rumours also claim that the Galaxy Note 5 will support UFS 2.0 Flash memory, the same as in the Galaxy S6 and S6 Edge. This would speed up the internal storage of the Note 5, letting you install and load apps much faster. We're pretty certain that the Galaxy Note 5 will be launched at IFA 2015 in September, and previous rumours have claimed it will also feature a Exynos 7422 processor, Samsung's first all-in-one solution, combining CPU, GPU, RAM, storage and the modem on a single chip.